The deep roots of Beaulieu Vineyard were first planted back in 1900, when founder Georges de Latour noticed similarities with his native Bordeaux and declared the Napa Valley ideal for winemaking. Planting vineyards in Rutherford with grafted, phylloxera-resistent French vines, the Cabernet Sauvignon that de Latour crafted from these grapes gave the world a taste of California’s promise as a world-class winemaking region. In 1938, de Latour hired the young Russian-French enologist, Andre Tchelistcheff. Today, Beaulieu continues to turn to innovative practices. Most recently, they completed a new state-of-the-art winery within one of their original buildings. 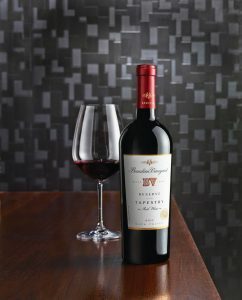 The Georges de Latour Private Reserve Winery utilizes the latest technology in combination with time-honored traditions for the production of this exceptional wine. James Suckling 94 Points: Complex aromas of blackcurrants, tobacco and stones. Some oyster shell. Medium to full body, very fine tannins and a polished, refined, textured finish. A wine that harkens back to its traditions. Drink now.